Did you know that one ounce of chia seeds contain 18% of your recommended daily calcium intake? Everyday, it seems we're learning more about the nutritional value of chia seeds. My husband, of all people, was the first one start the chia craze in our household. I thought he was a little crazy the first day he brought home a bag of chia seeds -- the first time I'd even heard of chia seeds in a way other than the plant seen on infomercials around the holidays, way before Ethan was a thought -- especially considering he's usually the hardest person to convince when it comes to all my great, novel, healthy ideas. Since then, I've warmed up to the idea of chia seeds and have been adding them to Ethan's diet for some time. 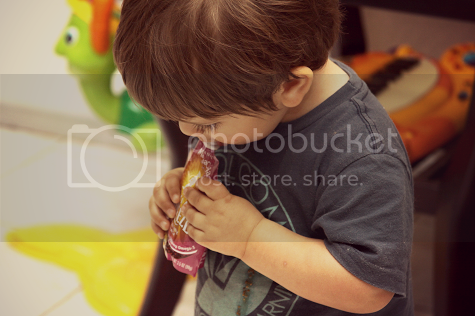 (His favorite is making them "sprinkles" on his yogurt, of course.) When I first heard about MammaChia Chia Squeeze pouches, I was pretty excited. These made for an easy way to add the benefits of chia seeds into Ethan's diet regularly while on the go. These USDA-organic pouches come in four flavors: Strawberry Banana, Green Magic, Apple Cinnamon and Blackberry Bliss. Each pouch contains organic fruit and vegetables -- no fillers or anything yucky -- and chia. 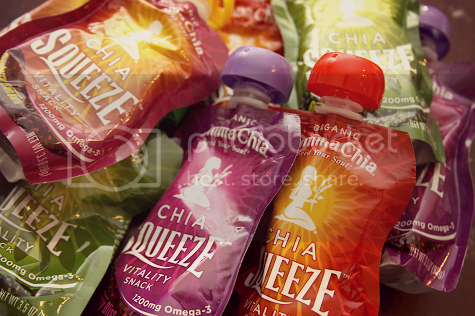 At only 70 calories per pouch, each Chia Squeeze is an awesome snack of choice which also contains 1200mg of Omega-3. I love that there is no added sugar to these pouches as well. These are the perfect snack for anyone, of all ages, adult and toddler alike! Ethan prefers them chilled in the refrigerator and refers to them as "smoothies." 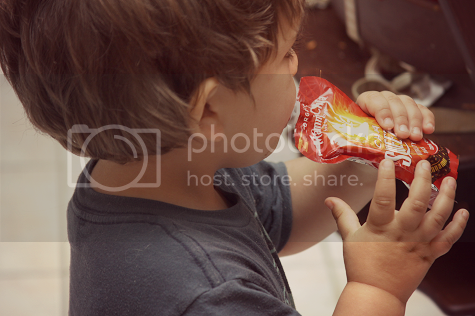 (We were playing outside when the FedEx man came to drop off our package of MammaChia Chia Squeeze pouches. The albeit adorable downside to this is Ethan now anticipates "a boy" coming to bring him "smoothies" every afternoon and is sorely disappointed when no one shows!) These Squeeze pouches are convenient for snacks on the go: after swim class, at the park, at a friend's house. Ethan loves the portability of the Squeeze in the sense he doesn't necessarily even have to stop running around the playground while sucking down his fruit, veggie and chia combo. It's a win-win for all involved. Lately, Ethan has also been enjoying the occasional Squeeze for breakfast and I can't complain. Each Squeeze is jam packed with nutrients, fruits, veggies and, of course, chia seeds. It's definitely a great and positive start to Ethan's morning! Ethan's favorite flavor is the Green Magic which contains a pretty impressive all organic ingredient list: chia seeds, banana, mango, spirulina, kale, pineapple. The "no GMO" logo on the back of each pouch is also an added bonus. MammaChia Chia Squeeze pouches are also vegan and gluten free. We were excited to have found MammaChia on the shelves of our local health food store and will be making it a point to pick some up whenever we're doing our shopping. These are the perfect healthy snacks for on the go, or even at home, without having to worry about preparation or mess. And, in the immortal words of Ethan, "smoothie SO GOOD!" 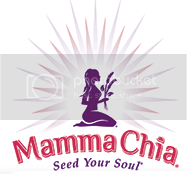 BUY IT: MammaChia's website offers a great store locator to find where Chia Squeeze pouches are available in your area! They also have an online store for added shopping convenience! 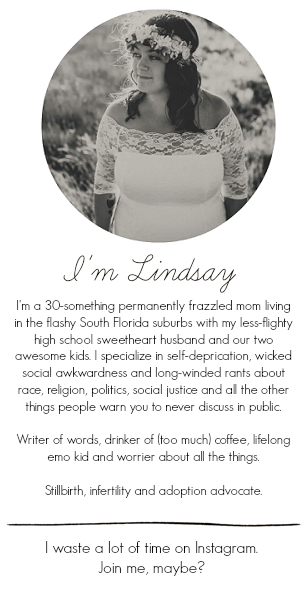 WIN IT: The fabulous folks at MammaChia have offered one of my readers the chance to win a pretty sweet Squeeze prize pack! A couple of each Squeeze pouches, a t-shirt, reusable bag and a frisbee for added summer fun! Giveaway is open to US residents. Good luck! We received these MammaChia Squeeze products to facilitate a product review. No compensation was provided and all opinions expressed are completely my own.